In keeping with emerging best practices among leading corporations, PG&E conducted its first materiality assessment for corporate sustainability in 2013—a strategic project to help us identify topics that are material to the long-term sustainability of our business. 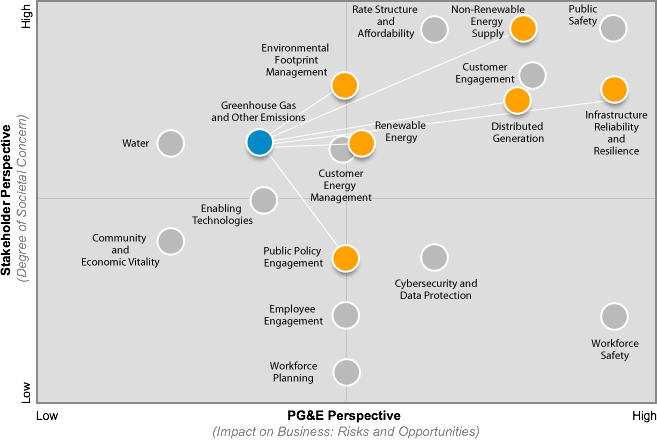 Conducted in coordination with PG&E’s strategic planning process, the materiality assessment was designed to engage stakeholders, identify opportunities and risks, and sharpen our corporate sustainability strategy and reporting. PG&E’s materiality assessment identified 18 issues. Every issue is material to PG&E’s long-term sustainability, regardless of its placement on the matrix. Safe operations, accident prevention, and company management of the impacts of energy generation, transmission, and distribution on long-term public safety. Highlighted items represent interconnected issues. The ability of customers to afford services, and the fairness and transparency of rates. Company actions to engage with customers regarding energy management (including energy efficiency), bills, safety, and overall company plans. Customer actions to engage in energy management solutions, including energy efficiency, demand response, and electric vehicle deployment. Contributions to local communities through business assets (e.g. job creation through supplier diversity) and civic engagement (e.g. philanthropy, disaster relief). The company’s management and choices related to the portfolio of non-renewable sources used for energy supply, including large hydroelectric, natural gas, and nuclear energy. The investments, infrastructure, and integration of renewable energy into the grid. Distributed generation of power among customers and suppliers, and the associated rates, transmission, and impacts on the utility business model. Technologies that enable energy transformation including smart grid, energy storage, and electric vehicles, as well as tools for customer engagement and energy management. Effective management of the company’s environmental, supply chain, energy supply, facilities, and other operational impacts related to pollution, waste management, land use and habitat protection, and biodiversity. The reduction and management of air emissions including greenhouse gases, nitrogen oxides, sulfur oxides, and particulate emissions. Maintaining water quality and availability through company operations and ensuring the short- and long-term availability of water for other uses. Managing and investing in reliable gas and electric infrastructure to provide consistent energy supply, balancing customer and investor interests, and preparing for earthquakes, wildfires, and future climate change impacts. Effectively protecting customer data, computer systems, grid infrastructure, and facilities. Ensuring the safety of PG&E employees and contractors. Maintaining a workforce with the required size and skill profile amidst generational shifts. Effective dialogue with employees and transparency around business goals and operations, labor relations, and diversity and inclusion. Ensuring alignment of public policy advocacy with company values, as well as transparency around advocacy. A material corporate sustainability issue is one that has the potential to impact PG&E’s long-term sustainability, based on the perspectives of internal and external stakeholders. This is different from, but related to, financial materiality, which is a threshold for influencing the economic decisions of investors. Material corporate sustainability issues are not limited to issues that could have a significant financial impact on the organization. Researched the landscape: Interviewed nearly 40 internal and external stakeholders, reviewed PG&E and industry research and reports, and reviewed media articles and related information. 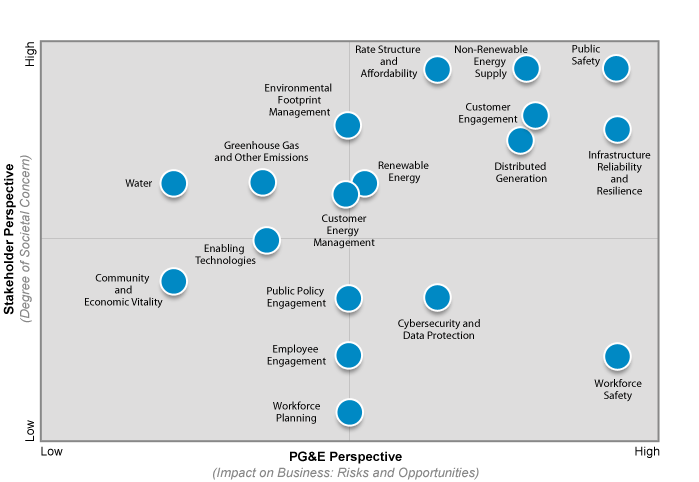 Identified material issues: Identified 18 material issues for PG&E’s long-term sustainability. Developed a materiality matrix: Assessed each issue on two scales: business impact to PG&E (both risks and opportunities) and degree of stakeholder concern. Used this assessment to create a matrix of material topics. A key goal of the assessment was to identify interconnections between the issues. Validated the results: Discussed, validated and finalized the results including engagement with PG&E’s Utility Strategy Committee, which is comprised of senior leaders from across our lines of business. The committee affirmed that each issue, regardless of its placement on the matrix, was material to PG&E’s long-term sustainability. Reinforced our focus on the basics of our business. The assessment showed that safety, reliability, affordability and customer engagement are top priorities both for PG&E and our external stakeholders. Showed interconnections among issues. For example, the assessment illustrated that enabling technologies—such as those related to the smart grid, energy storage, electric vehicles and customer energy usage data—present many opportunities for PG&E and are connected to issues ranging from customer engagement to renewable energy. This interconnectivity provided insight into how we might approach issues in a more integrated way. Highlighted the importance of emerging issues. For example, the assessment identified infrastructure resilience (including adapting to the effects of climate change) and water conservation and management as important issues. Both of these have garnered increasing attention across PG&E and our industry due to recent weather and drought conditions. PG&E continues to make progress on addressing both of these issues across its operations. Water’s importance to PG&E is notable in its many interconnections to other material issues, such as the reliability of our service. For example, PG&E’s active focus on the resilience of our extensive hydroelectric system is captured in the issue of Infrastructure Reliability and Resilience. In the months since its development, the assessment and supporting analysis have been used in numerous ways, including as inputs to PG&E’s strategic planning process. They have also prompted modifications to our corporate sustainability reporting and focus, and will continue to inform our goals and strategies in the coming years. However, we also understand that PG&E’s materiality matrix is a snapshot in time. We will refresh the assessment on a regular basis to capture other emerging risks and opportunities, inform PG&E’s strategic planning process and support our ongoing dialogue with external stakeholders. © 2014 PG&E Corporation. All rights reserved.